Why I don’t eat Indian food more often, I cannot tell you. With the first bite every time I eat it, I think to myself this is some seriously incredible flavor. 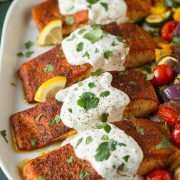 The fragrant blend of spices and herbs and the creamy sauces that often accompany it, they are simply mouthwatering. So my husband still orders the newspaper. Yes, he’s 28 years old, but sometimes I wonder if he grew up in a different era =). He says he has always read it every morning since he was a kid. I don’t like the newspaper. They could seriously find some more positive things to talk about if you ask me. Why is the media so hooked on the negative? The only time I like to pick up the newspaper is when I see something food related, like the Relish magazine that comes on occasion with the Sunday paper. This past Sunday they had a similar version of this which inspired me to make this recipe. I’m in love with these chicken kebabs. 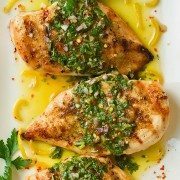 And the lemon cilantro yogurt dipping sauce is the perfect, tangy blend to coat this savory chicken. You can omit the cream if you want to keep this recipe lighter, it is optional but I love it in Indian food. I also wanted some light form of sweetness to balance out the acidity of the lemon and tang of the yogurt and the sweetness of the cream did just the trick. Enjoy! 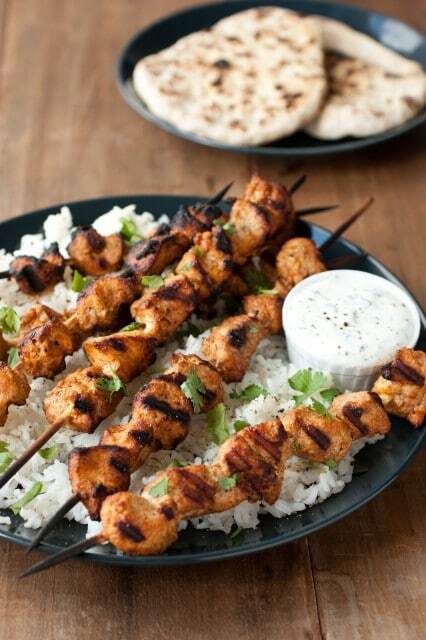 Deliciously spiced Moroccan style chicken kebabs that are marinated and perfectly grilled then served with a delicious herbed yogurt sauce for dipping. In a mixing bowl, whisk together olive oil, lemon juice, 1/2 tsp lemon zest, 2 cloves garlic, coriander, cumin, paprika, cayenne pepper, cinnamon, salt and pepper. 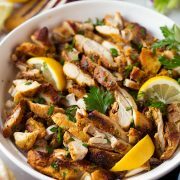 Place chicken pieces in a large resealable bag and pour marinade over chicken. Seal bag and press chicken into marinade. Allow to rest at room temperature for 30 minutes. Thread chicken onto skewers (if using wooden skewers soak in warm water for 5 minutes). Preheat a grill over medium-high heat. Brush grill lightly with oil and grill chicken, rotating once halfway through grilling, until cooked through, about 9 minutes. Serve warm with Lemon Cilantro Yogurt Sauce. Combine all ingredients in a small mixing bowl. Store in an airtight container in refrigerator. felicia | Dish by Dish: Hi Jaclyn! 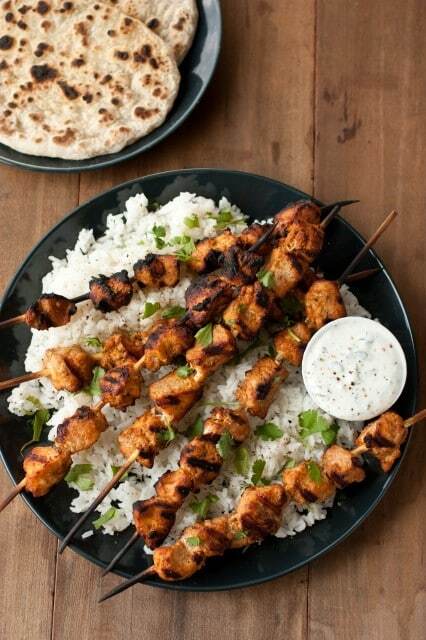 These kebabs look so good! Love the sauce that goes with it! I’d love to include your coriander chicken kebabs in a chicken roundup I’m doing for Parade Magazine. If that’s fine with you, could I use one of your lovely photos with a link back to this original post (https://www.cookingclassy.com/2013/04/coriander-chicken-kebabs/)?